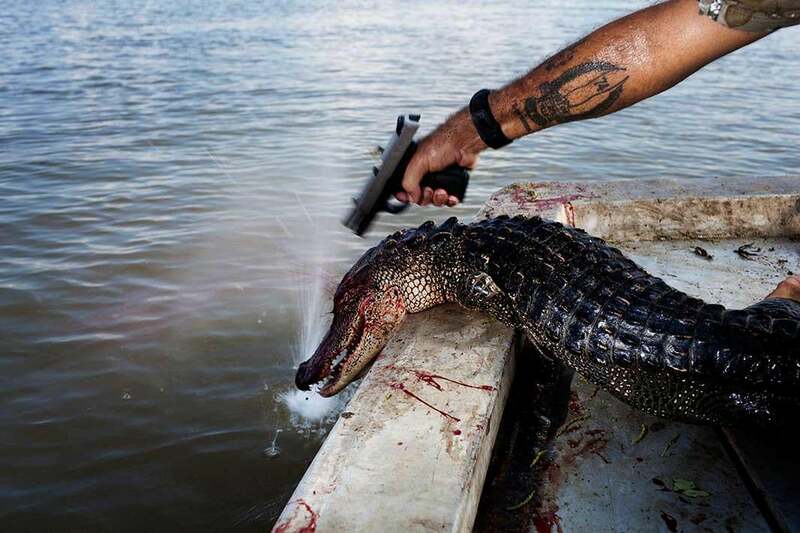 Curtis “Rebel” Rageur plants a second bullet in the head of a gator that kept moving after being hauled into the boat while Rageur was hunting for alligators near Shell Island, La., on Sept. 20, 2009. Each gator is tagged before being piled in the bottom of the boat. At the recommendation of a friend, Eich started his investigation by spending time with two alligator hunters on the job. “I was just dropped off on the boat dock and went out with them two days in a row. I went back driven by fascination for the people and an interest in how we exploit our natural resources,” Eich said. 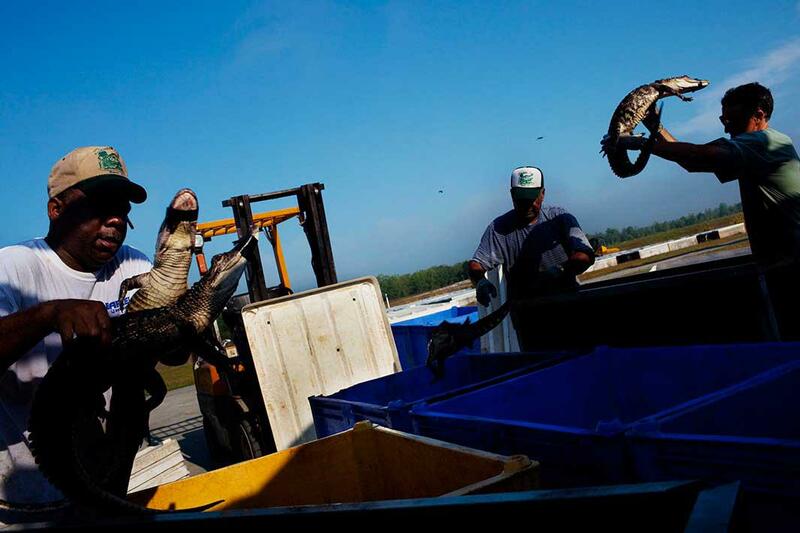 More than 300,000 alligators are harvested annually in Louisiana alone. According to Louisiana’s Department of Wildlife and Fisheries, alligators are the largest reptiles in North America. Females can grow to be 9 feet long and more than 200 pounds; males can grow up to 13 feet long and more than 500 pounds. 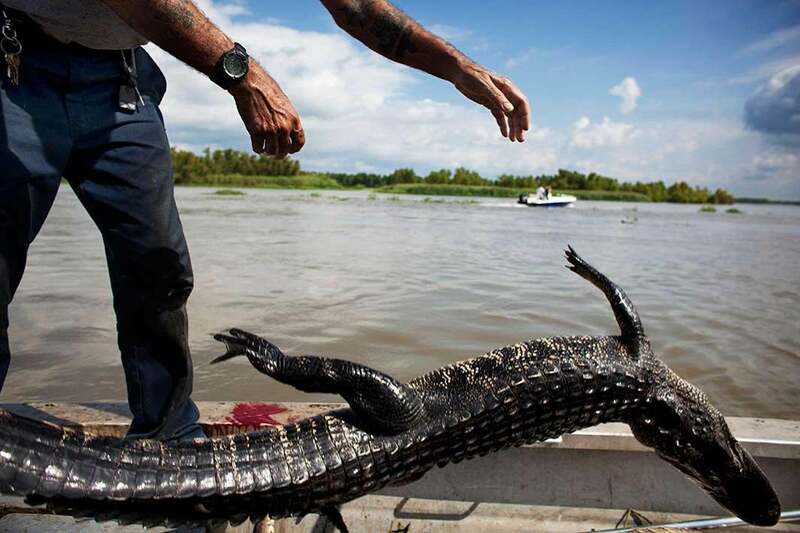 Eich said those who hunt these animals in the wild can sometimes be in great danger, especially when an alligator on the line jumps on land, and the hunters have to wade through thick reeds to find it. Generally, though, Eich found the hunting fairly routine. “You go to the pole, see the lines in the water, pull it in, see if there’s something in there, pop it in the head, put in the boat. It’s pretty straightforward. There are only so many photographs that are going to come from that,” Eich said. From left, David “Shot” Livas, 48; his stepfather Chester Wolf, 71; and Stephen Paul Bonnecarrere Sr. sort alligators by size at dawn on Daneco Alligator Farm in Houma, La., on May 24, 2010. Rageur tosses a recently caught gator into the bottom of the boat while alligator hunting near Shell Island on Sept. 19, 2009. 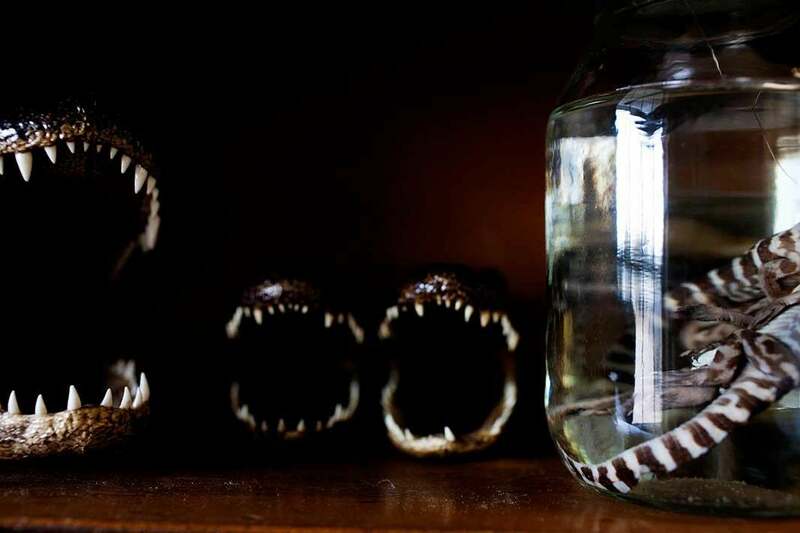 Mounted alligator heads and underdeveloped gators in a jar of formaldehyde decorate a display case at Daneco Alligator Farm in Houma on Feb. 18, 2010. From farming to hunting to tourism, the alligator industry is historically a big business in Louisiana. The sale of raw meat and hides alone can yield more than $50 million annually in the state. But when Eich visited Louisiana, the country was deep in the recession, and people in the alligator industry were suffering. Hides once worth $37 per foot were only bringing in $11 per foot. “They were running their business as usual, but they weren’t able to move their product. So they were developing a backlog and that was a real problem. The value of the skins was going down,” Eich said. While Louisianans might look at alligators they way New Yorkers see rats or Texans see rattlesnakes, Eich said he’s found that for many Americans, the great reptiles have a special mystique. “Alligators are these kind of mythical creatures in a way,” Eich said. Check out Eich’s website for information about his self-published zine, Smoke Signals. You can also follow Eich on Twitter and Instagram. 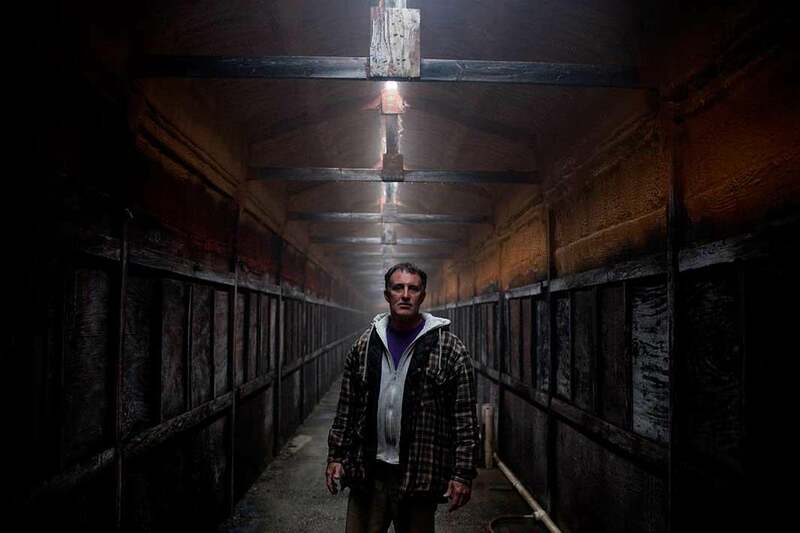 Bonnecarrere stands in the walkway of a building where alligators are raised at Daneco Alligator Farm in Houma on Feb. 19, 2010. 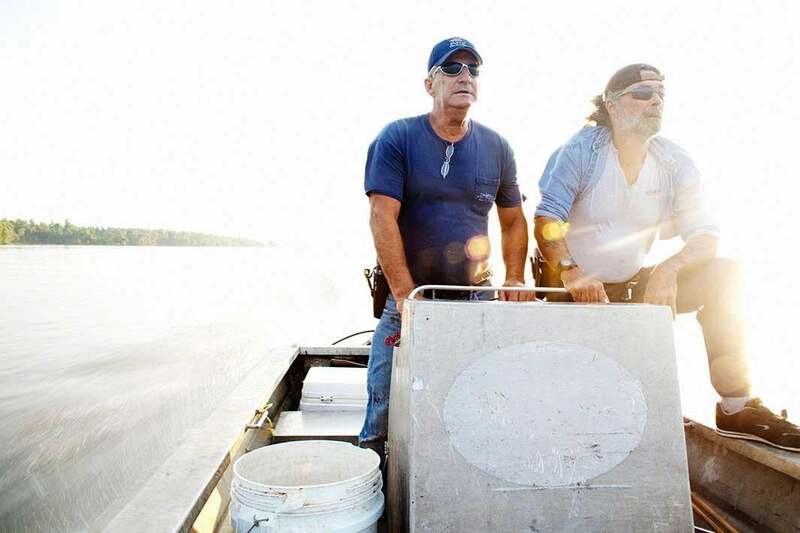 Each compartment to his left and right houses approximately 120 young gators, which are raised in the dark and nourished by an automatic feeding system that was engineered by Bonnecarrere’s father-in-law, Dane Ledet Sr.
Julius Gaudet, 62, (left) and Rageur glide over the tranquil surface early in the morning as they begin their day hunting for alligators near Shell Island on Sept. 19, 2009. 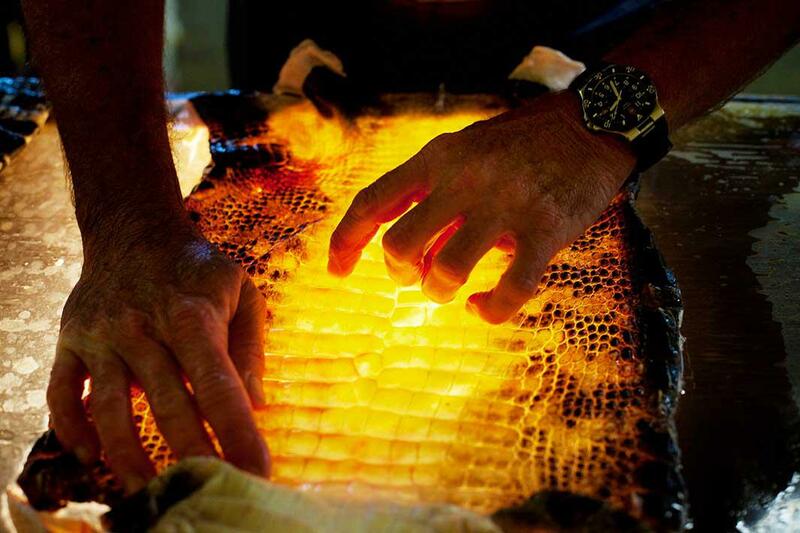 Bonnecarrere grades alligator skins, inspecting them for defects on a light table at Daneco Alligator Farm in Houma on May 24, 2010. 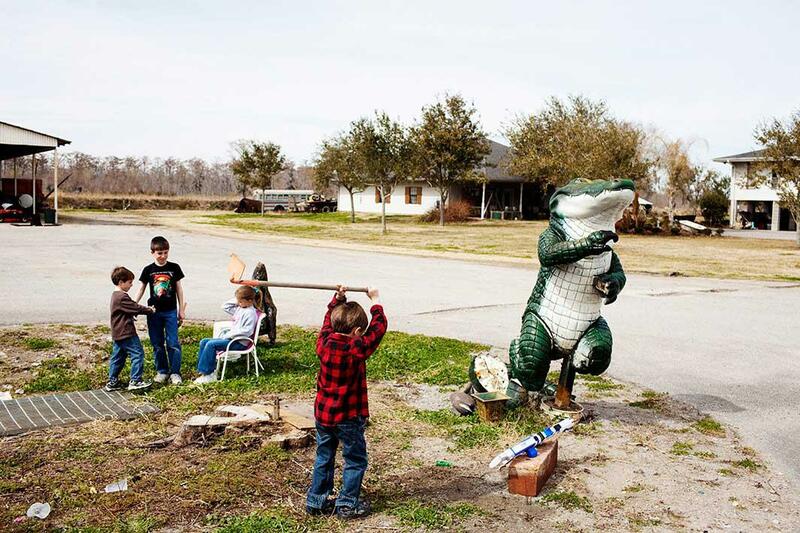 Spencer Bonnecarrere, 6, chops at the dirt in front of the office of Daneco Alligator Farm in Houma on Feb. 18, 2010, as his siblings Stephen Paul, 10, and Stuart, 5, and cousin Victoria Bourg, 6, play in the background. 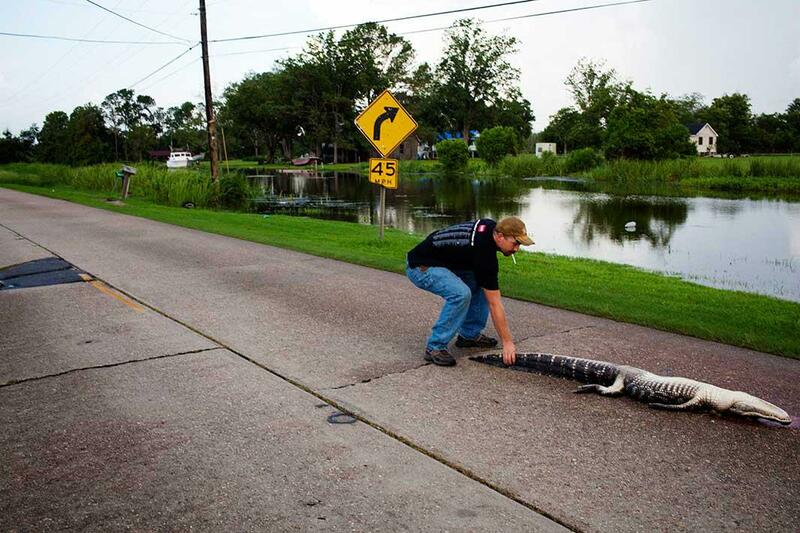 A man hauls a dead gator off the road after it was hit by a car in Houma on July 6, 2010. 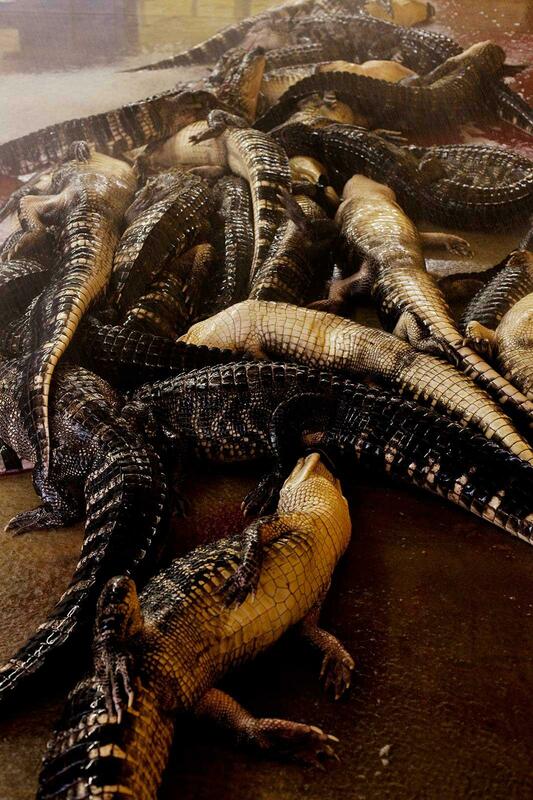 Recently killed gators are hosed down before skinning at Daneco Alligator Farm in Houma on May 24, 2010.